Home » Blog » Live Video Verification – What is it? When an intruder alarm activates, either sending a message directly to the premises owner or keyholder, or a signal to an Alarm Receiving Centre where a professional operator processes the alert, no one can actually be sure whether a real intrusion has occurred or whether it is a false alarm. Of course, if “confirmation technology” has been configured and more than one detector has activated then you can be fairly confident that someone or something is moving around in your property. But is it your cleaner who forgot their code, your dog that escaped its locked room, an equipment failure or an intruder? Rather than drop everything and rush home in a panic or have the Police called out perhaps unnecessarily, with “Live Video Verification” technology you can remotely view footage of your property to visually check what has happened, and what is actually happening right now. Using the world class RISCO LightSYS2™ or Agility3™ intruder alarm systems we can install IP cameras at strategic locations either in or around the property. These cameras are connected to the secure RISCO Cloud via your router and linked to the intruder alarm. Ideally cameras should be positioned in areas where there are detectors, so if a particular detector activates footage from the specific area can be viewed. 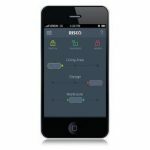 If the alarm activates, you are notified by an alert to your smartphone via the iRISCO app. Generally, you will be able to view a few seconds of footage directly before the activation as well as footage during – which will enable you to verify if anyone was there. You can also stream live video. The Agility3™ has a lower cost option of a movement detector with incorporated camera which if activated takes a series of snapshot photos at the immediate time of activation which are then transmitted via the RISCO Cloud to the iRISCO app on your smartphone. With the ev olution of technology in the areas of IP, smartphones and apps, Live Video Verification is a fantastic tool for added peace of mind especially for self monitoring consumers. Cameras however still have a premium and it is perhaps more cost effective to strategically place a couple of cameras rather than have several installed. It should be noted that Live Video Verification does not and cannot replace traditional CCTV systems that are designed to provide continuous, high quality recorded evidence and live viewing of designated areas. Where a professional CCTV system is required, these too can be viewed remotely via your router and an app, so if you receive notification that your intruder alarm has activated then you can log in to your CCTV system and watch the live view and also playback to see what occurred. Here at Security First (UK) we always discuss a client’s specific needs in order to determine the most cost effective system (or integration of systems) that will provide the working solution that they actually need.